A puzzle game for those who enjoy a logical challenge. The object is to see how many tiles you can place, thus getting as high of a score as you can. Tiles can only be played if the pattern on the tile matches the pattern on the board where the tile is placed. The object is to gain as many points as you can. Place a piece from your hand to the board to gain points. Every ten pieces played produces a raise in level. Certain pieces have constraints on where they can be played. These constraints show what the neighboring tiles must be for this piece to be placed on a specific tile. 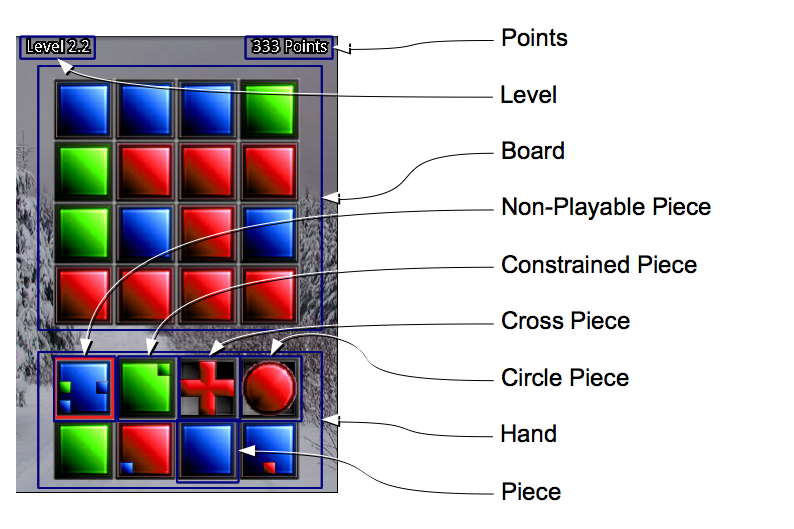 The higher level you are the more points you will gain for placing a piece, yet the more constraints a piece may have. Certain pieces will change more than the color of the tile where they are placed. The cross-shaped piece changes the colors of tiles above, below, to the left, and right of where they are placed. The circle-shaped piece changes the colors of all connected tiles with colors matching the tile where it was placed. Drag a tile from your hand to the board to place it on the board. Drag the board to rotate the board. Place piece on its same color and you will get a bonus. Place a piece with a constraint that uses the tile that the last piece was placed on and you will get a bonus. Fill a column or a row with all of the same color and you will get a bonus. Fill the entire board all of the same color and you will get a bigger bonus. The board will reset itself with random colored tiles as well.